100 years later Shaw’s words described exactly how I felt when I disembarked on Skellig Michael. So for me there was no surprise when Lucas films chose this ‘dream world’ for their Star Wars movie. On the day I visited it was a perfectly calm day in late spring with clear blue skies. Sean Gilhooley of Skelligs Boats told us how lucky we were to be able to disembark. Even on what seems like a calm day as you leave from Ballinskelligs Pier, it can be a very different seascape when you reach the Skellig Islands. Landing there is very much weather-dependent, even in the summer you are never guaranteed a sailing. 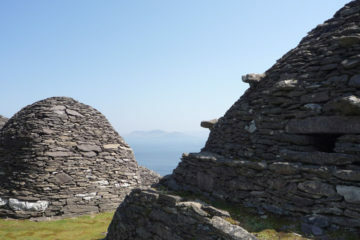 It’s always best to ring in advance to book your place on a Skellig boat trip several of which leave from the piers at Caherdaniel, Portmagee and Ballinskelligs. The decision whether or not to go is often made by the skipper on the day of departure. The boat trip out from Ballinskelligs Pier takes about 40 minutes on a fast boat and costs approximately €60 to €70. This may seem expensive but believe me, it’s worth every penny to visit one of Ireland’s magical islands. On the day I travelled there were just eight on the boat and despite seasickness warnings, we all had sea legs. 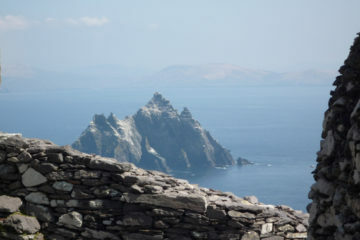 Upon approaching Skellig you could immediately understand just why one would want to commune with God and nature here. From the moment we disembarked, you could hear the seabirds and see the first of the puffins. Puffins are summer visitors and arrive in early April to the first week in August. 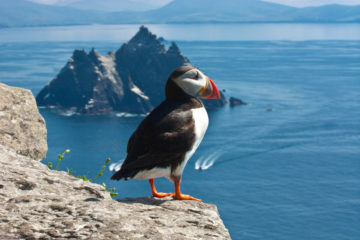 These gorgeous, comical birds nest and breed on the sea stacks and cliffs of Skellig Rock. They even evict the rabbits from their burrows and use them as their new nesting place. Sometimes I thought they were dancing and diving to put on a show just for us. 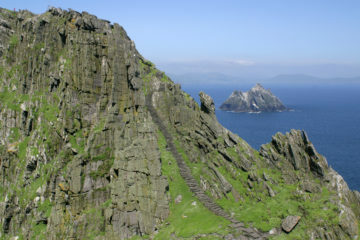 The 600 steps to the top of the Skelligs to the beehive huts isn’t a difficult climb but it’s not for the fainthearted or those with a fear of heights. Whilst you don’t need to be super fit, it does help if you can climb a number of steps without stopping too much. Quite honestly I did not find it tricky and took my time to inhale the fresh sea air and soak up the views of the Atlantic Ocean. Upon reaching the summit you finally get to really experience the splendor of nature and simply just ‘be’! You are left to explore and discover the rocks for at least 2 hours. There are no facilities on the island so bring a packed lunch, drink and don’t forget your camera! 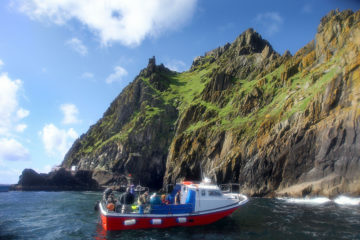 If you are thinking of taking a boat trip to Skellig Michael this summer we have a number of self-catering holiday homes situated close Ballinskelligs Pier and Portmagee Pier on Valentia Island. We also have a selection of unique and idyllic holiday cottages ideally situated to explore the magical Kingdom of Kerry. View our range of Kerry holiday homes to rent here. Joan and Kevin on Exploring County Kerry ‘The Kingdom’ Callum on Into the West!